Shows the lost location of the Egyptian Labyrinth, said to be ancient Egypt's greatest wonder, as described by Strabo and Herodotus. 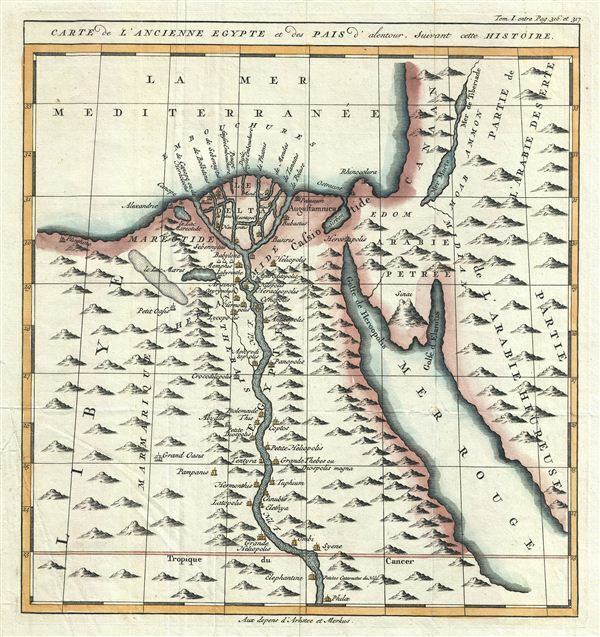 Carte de L'Ancienne Egypte et des Pais d'alentour, Suivant cette Histoire. Several archeological surveys have been undertaken to unearth the labyrinth, but so far no findings have been confirmed. This map was published by Arkstee and Merkus as page no 316 and 317 in Bossuet's L'Histoire Universelle. Jacques-Bénigne Bossuet (September 27, 1627 – April 12, 1704) was a French bishop, historian, and theologian, renowned for his sermons and other addresses. He has been considered by many to be one of the most brilliant orators of all time and a masterly French stylist. His career was long and distinguished and included countless honors, including 11 years spent tutoring the Dauphin Louis XIV, who, arguably, would become one of France's greatest kings. Bossuet was widely published and the bulk of his work focuses on theological doctrine and sermons. However, he also published a popular history, L'Histoire Universelle, that went through many editions long after his death from kidney stones in 1704. Bousset, J. B., L'Histoire Universelle depuis la commencement du monde, jusqu'a present, traduit de l'anglois d'une socie'te' de gens de lettres, (Paris: Arkstee et Merkus) c. 1750. Very good. Blank on verso. Minor creasing in bottom left quadrant. Minor wear along original fold lines.